Wickedbone is world's first small & interactive dog toy developed by Cheerble Technology Co. Ltd. The company focuses on creating a premier brand for smart pet products. Wickedbone is a bone-shaped interactive gaming device that works like a real bone plus a smart exciting wicked companion for your dog. A fun, entertaining and stimulating exercises that your dog will always love to be around. An easy app connected with your smartphone can make the things much easier for everyone. It's drive mode help user control the Wickedbone through a compatible app and allow it to function through 9 available motions. You will then create and realize it's new action as it moves. With an interactive mode, it automatically attracts your pet's attention without needing any manual operation. Wickedbone acts responsively to types of touch and keeps your pet in a perfect mood. Its so perfect when you are busy doing other things. 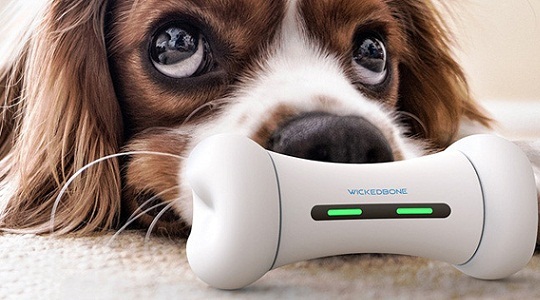 Wickedbone is a perfect solution over conventional edible bones, giving pet-owners a good time to have fun and great experience with their pets.